3 Bedroom Link Detached House For Sale in Leicester for Offers in excess of £285,000. 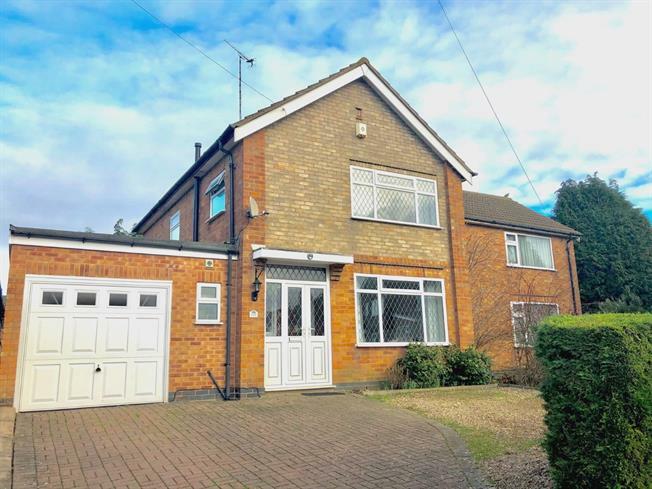 Spencers Estate Agents are delighted to offer this much improved extended Three Bedroom linked detached family home pleasantly situated within the highly desirable location of Oadby. The accommodation comprises briefly of main entrance hall, lounge, dining room, conservatory, fitted kitchen, utility, downstairs cloakroom, landing to three bedrooms, refurbished shower room, front and rear landscaped gardens, off road parking and garage. Internal inspection comes highly recommended. Entrance porch way uPVC double glazed doors to the front aspect. Main entrance hall with radiator, carpeted flooring, under stair storage, painted plaster ceiling with ceiling light, downstairs W/C and Cloakroom off. Double glazed uPVC window with leaded glass facing the front aspect. Radiator, carpeted flooring, painted plaster ceiling with wall lights and feature ceiling light, living flame gas fire with stylish surround and hearth, bi-folding doors to Dining Room. UPVC sliding double glazed doors to the rear aspect leading to conservatory. Radiator, carpeted flooring, painted plaster ceiling with ceiling light. Of brick and uPVC construction, double glazed uPVC windows, complimentary flooring. Two double glazed uPVC window facing the rear aspect overlooking the garden. Radiator, tiled flooring, painted plaster ceiling with ceiling light. Roll top work surfaces with fitted units, double sink, integrated oven, integrated hob, over hob extractor, complimentary tiling throughout. Wooden rear door with double glazed window opening onto the garden, tiled flooring, painted plaster ceiling with ceiling light. Roll top work surface, under surface space and plumbing for washing machine and dishwasher, access to garage. Ground floor W/C. Double glazed uPVC window with obscure glass facing the front aspect. Radiator, complimentary flooring. Low level WC and pedestal sink. Double glazed uPVC window facing the side. Carpeted flooring, painted plaster ceiling and ceiling light, loft access. Double glazed uPVC window facing the front aspect. Radiator, carpeted flooring, painted plaster ceiling and ceiling light, large fitted robes. Double glazed uPVC window facing the rear overlooking the garden. Radiator, carpeted flooring, painted plaster ceiling with ceiling light. Range of fitted robes. Double glazed uPVC window facing the rear overlooking the garden. Radiator, carpeted flooring, painted plaster ceiling with ceiling light. A refurbished three piece suite with double glazed uPVC window facing the side aspect. Heated towel rail, stylish tiled flooring, painted plaster ceiling and feature lighting. Low level WC, double enclosure shower with power shower, vanity unit with sink. Complimentary tiling throughout. The property boasts a landscaped rear garden with large patio area, a range of mature shrubs and plants, trees, lawn area, fenced and hedged borders, shed, feature pond and outside water tap. The front of the property is landscaped with block paving providing ample additional off road parking (up to three cars approximate) and driveway leading to garage, hedged borders. Integral garage with up and over doors, power and lighting, small workshop with bench area.